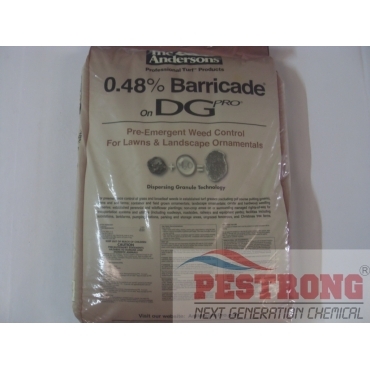 Where to Buy Barricade DG Pro, Barricade 0.48% DG Prodiamine Granular - 50 Lbs - $72.95 for Sale with Fast Free Shipping! Barricade 0.48% DG Prodiamine Granular - 50 Lbs is a pre-emergent herbicide for prevention weed control. Rate : 1.8 - 7.2 lb per 1,000 sq.ft. (78 - 313 lbs per acre); one or two application per year. This 50 lbs bag covers up to 27,777 sq.ft. I've had problem with Johnson grass and so I've tried barricade and it did an awesome job! I tried few pre-emergents before but I had no luck but it looks like I finally found the stuff that works for me, I am really happy!